Spiky Surprise is the third level of the special world Cloud in Donkey Kong Country Returns 3D. It represents the Ruins world from Donkey Kong Island. As the main hazard, this level features many spike traps, which the Kongs must flee from. It also contains switches that cause platforms to pop out of grooves, enabling the player to reach higher or farther platforms. A small portion of the level is based on blasting through Barrel Cannons. Donkey Kong and Diddy land near a slope. Moving backwards, there is a wall with turf and a plant holding a Puzzle Piece. Walking to the right, they encounter two Tiki Goons, a Stilts and a spiked plank. A switch activates a platform to another Tiki Goon and a Barrel Cannon. It blasts the Kongs upwards. On the next floor, they must press more switches to traverse a walk full of spikes, while avoiding Tiki Bombers. A Tiki Tank and a Flaming Tiki Buzz are found before the checkpoint. Another Barrel Cannon blasts the player to a vertical corridor where its spiked walls slowly close, forcing them to climb the platforms quickly while dealing with Tiki Goons and a switch. The next area features more switches, a Tiki Bomber and Stilts. A big switch makes a wall of appear spikes move to the right. 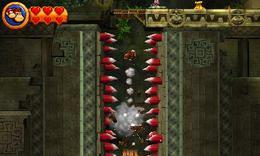 The Kongs must run through a narrow passage to avoid being hit by the spikes. Following it there is a short area out of the ruins where they must blast through Barrel Cannons avoiding Tiki Zings. Returning to the ruins, Donkey Kong must again avoid a wall of spikes until he reaches a Blast Barrel that launches him to the Slot Machine Barrel. Immediately at the start of the stage, the player must walk to their left and climb a grassy wall and then pound a plant on the ceiling, releasing the first Puzzle Piece. After pressing the last switch before the checkpoint, the Kongs must wait until the second platform disappear, falling into a secret Barrel Cannon that blasts them to a Bonus Room. Here, they must collect every Banana and Banana Coin to get the Puzzle Piece. While in the vertical corridor, the Kongs must pound a vase to reveal the third Puzzle Piece. The player must pound another vase, this time after activating the first moving wall of spikes. During the second portion with a wall of spikes moving to the right, there is a grassy pillar with a plant, where the last Piece is hidden.